Over the weekend I finally got around to cleaning out the pantry, a long overdue chore that I have been putting off for months, mostly because it was so bad I did't even now where to start. In cleaning out the pantry I found several half-eaten containers of crackers and cookies from Trader Joes. If you don't have a Trader Joe's near you, it's a chain of grocery stores that sells their own products, usually organic and often at a good price. 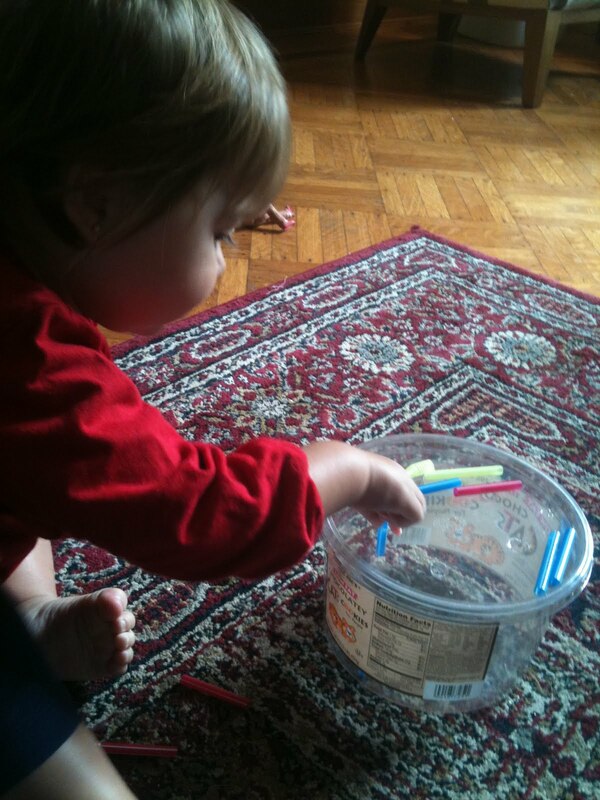 We love their cat crackers that come in these great platic tubs, perfect for making a straw sorter. The straw sorter is easy to make, it only takes a few minutes and you probably have most of the materials in your house or recycling bin. All you do is find a platic tub, I found the cat cracker tub from Trader Joes works great. Use a marker to mark where you want the holes to be and then using a pair of closed sciscors drill the holes into the plastic. Use any plastic straws and cut then into pieces small enough to fit inot the container. Both the Bean and my Nephew L spent a lot of time this weekend playing with this. It is great for their motor skill development and focus. I just left my tub as a simple straw sorter but if you have older children you could make it a color sorting activity. I saw a great post about making a color sorter this morning at Mess For Less: http://www.messforless.net/2011/09/color-drop-game.html.